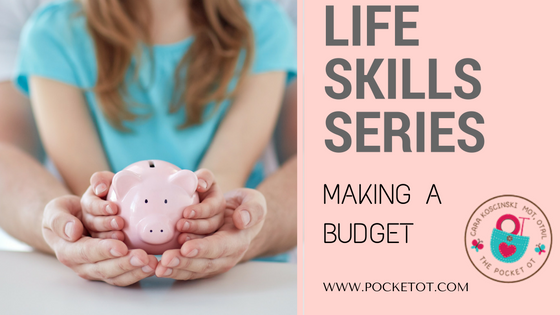 Budgeting is one of the most difficult life skills to both CREATE and FOLLOW. The face is, it seems as it should be the ONE thing that is easy for people to understand. However, the real truth is that budgeting is hard. Sometimes it’s easy to get the budget down and other times it can seem like the hardest task in the world. Don’t make budgeting harder than it should be, check out this guide to making a budget. I’ve broken it down into a few easy steps for your entire family to follow. Let’s GO! Teaching can be done in many ways. The most effective is always to use more than one sense. So, don’t just outline the steps and walk away…..involve everyone in the household! Organize the budget area with a few bins, folders, and/or paper holders. I LOVE adding a piggy bank so kids can ‘see’ the savings area and ‘feel’ it getting heavier as savings build up. You can use real OR pretend money. 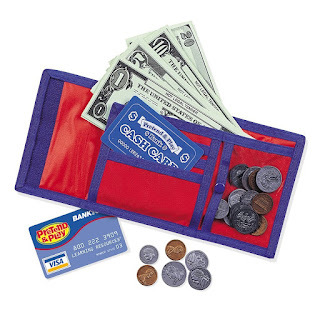 Here’s a link to the pretend money we use in our household and homeschool. You would be surprised to know that most people don’t know the total sum of their income every month. Before you can create a budget, you need to know how much money is coming in every month. Make this your first stop for understanding a budget. Listen, you cannot make a budget on credit, it just does not work. Making a budget consists of using cash only. You can use your bank account too, but the gist of budgeting is to make sure you have a hold of your cash and know how to spend it. The next step to creating a budget is to know what you pay out for everything each month. You can make this easy for yourself by writing out each bill or expense that you have each month. Not only do you want to write out what you pay, but how much you pay. One of the hardest parts of a budget is keeping everything where it’s supposed to go. You know, not pulling from the car fund to pay for the house fund. The reason for a budget is to make sure you stay within your means, which means no borrowing from other budgets. This may take some restraint, but it is possible to accomplish. Once you have done the work of getting the budget off the ground, get the whole family on board. Your spouse may not be too keen on a budget at first, but he/she will come around. Getting the whole family on board with the budget will help it to become successful. Kids are surprisingly helpful when it comes to reminding their parents of things like budgets. Plus, by getting the kids involved, you are teaching them life skills that they won’t be able to learn anywhere else. What tips would offer someone who wants to make a budget? Click Here for our next Life Skills Post……Emergency Preparation!